Nowadays, we have to do some flashy advertising to stand out from other brands. This is especially true in the cosmetics industry. Take for example Human Nature‘s cosmetic retail display. It is an excellent example of an attractive POS Display that combine different qualities and technologies. We found this retail cosmetic display in the Philippines. What do we like about Human Nature’s Retail Cosmetic Display? 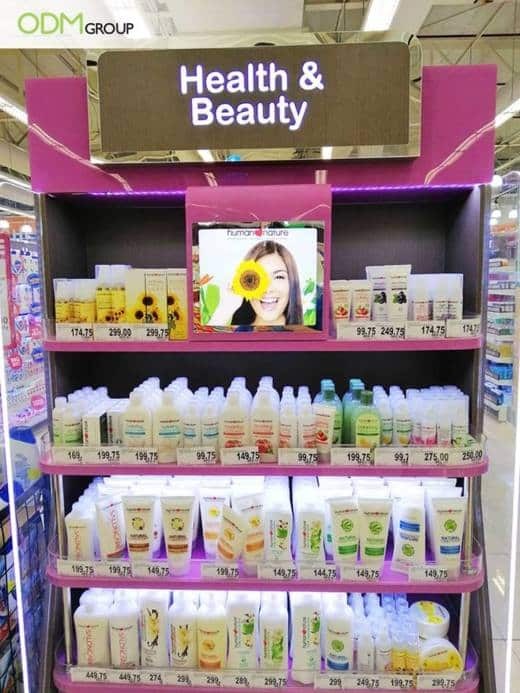 Technology: With its LED backlit-poster that features a picture of a girl, this cosmetic product display became dynamic. The LED lights also help to make the point of sale display look warmer. And this makes the products stand out and eye-catching so customers, which makes customers want to check out their products. The lighted up “Health & Beauty” sign also helped to increase brand visibility. Color: The use of the purple color makes the POS Display more welcoming because it evokes comfort and royalty. It will stimulate the sales because according to the psychology of colors, people feel reassured by this color. Materials: Using high quality materials like Human Nature did is very important because the POS Display unit will be the first thing that people will see. As we know, you will never have a second chance to make the first impression! It means that the POS have to look good so people will have a positive impression of your brand at first sight. If you want an attractive custom POS Display, make sure to make something original, dynamic and colorful. Also, do not crowd your POS Display with irrelevant items or props, otherwise it will become too messy. Shoppers might get overwhelmed by all the products, and this could push them away. The use of a customized POS Display definitely makes customer’s shopping experience better. Moreover, it frames the product well so they stand out. So, if you need help to create your very own merchandise display, do not hesitate to contact The ODM Group. Our team specializes in making custom promotional merchandise, custom branded packaging, as well as POP and POS displays will be very happy to help you. Click inquire today to get in touch to find out more. We definitely love this Unique Custom Liquor Display by Chivas thanks to its LED lighted POS display and choice of color. An outstanding store banner design from Purefoods. It’s an excellent example of an effective POP display thatyou need to check out.